The phone booth suggests a world in which communication is precious, urgent, clandestine, contingent. 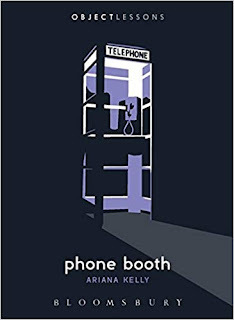 People talking in phone booths and at phone kiosks often exhibit an angle of repose—what is, in geology, “the maximum slope, measured in degrees from the horizontal, at which loose solid material will remain in place without sliding.” Virtually no one stands up straight; nearly everyone leans, usually against the triangular shelf beneath the telephone, or against the wall of the booth itself. They follow the line of the telephone, which follows the line of the face. It is an angel of nonchalance, absorption, self-importance, seduction; they are on the verge of sliding. David Bowie played with this lean beautifully on the back cover of his album Ziggy Stardust. In the photograph Bowie, as the alien Ziggy in a turquoise jumpsuit, stands in a British telephone box, arm resting on his hip, the other on the telephone, ready to call home from London.